When infrastructure constraints preclude loading and unloading aircraft at the terminal, airports need to get creative. Mobile boarding ramps and airside buses are two options operators are using to keep passengers safe and comfortable as they enter and exit planes on the tarmac. Seattle-Tacoma International (SEA), operated by the Port of Seattle, uses both to help cope with growing traffic levels while waiting for major gate expansions that are more than a decade away. For the last six years, SEA has broken its previous annual passenger records; and last year, it served 45.7 million travelers. With passenger growth consistently outpacing facility growth, alternative boarding operations are an everyday necessity. "Operating 46 million annual passengers from an 80-gate facility with little to no room for gate expansion requires the airport to consider the use of bussing passengers to remotely parked aircraft," Port Operations Manager Ben Leischner says. In 2015, the Port purchased three COBUS 3000 airside buses, each capable of accommodating about 100 passengers. More recently, it purchased four more similar vehicles scheduled for delivery in June. The new buses include passenger information systems, flight destination displays and closed-circuit televisions-all in an effort to ease passenger transportation within the airport and provide the highest level of comfort and security, says Don Frassetto, president of COBUS Industries. Leischner notes that the Port works diligently to lead the industry in adopting technologies that can contribute to improving facility utilization, safety and passenger experience. "Bus gates" and remote passenger hardstands are assets that closely align with those goals and help SEA operate safely and efficiently out of limited facilities, he explains. To enhance the safety and comfort of travelers arriving or departing at remote hardstands, the airport uses mobile passenger boarding ramps that are covered and lit. In mid-May, SEA was using two units from Aviramp Ltd.: one Continental-757 model, which is capable of handling aircraft ranging from an Embraer 170 to a Boeing 757, and one International model, which is capable of handling Airbus A320s to A380s. The airport has also ordered another three Continental-757s and one more International model, for delivery next year. According to Leischner, the airport anticipates needing a total of 11 mobile boarding ramps to support projected hardstand operations. Terri Smart-Jewkes, global sales and marketing director for Aviramp, notes that the company's mobile ramps are customizable, and the firm works with each airport to ensure that the equipment meets its specific operational needs. • functionality to allow towing and operation by diesel motor for docking of aircraft. Leischner emphasizes that SEA is committed to providing all passengers with the highest level of customer service, whether they arrive or depart directly from the terminal or at a remote parking location. Covered mobile boarding ramps allow passengers to avoid stairs and exposure to the elements, he explains. Each of the Aviramp units deployed at SEA includes a clear/tinted polycarbonate plastic covering with an expanding canvas canopy to protect the aircraft galley and passengers from inclement weather. With even more passengers expected in coming years, mobile boarding ramps and airside buses will likely be important tools at SEA for the foreseeable future. "[They provide] valuable gate capacity during peak periods of operation," Leischner explains. Master planning is ongoing, but major gate expansion is not expected until around 2029. Meanwhile, forecasters predict continued traffic growth-66 million annual passengers by 2034. Efficient and comfortable hardstand operations could also prove pivotal during SEA's upcoming capital improvement program, which could require the temporary closure of parts of the terminal. "While we are busy today, it will only get worse once we close gates during construction of expanded facilities," predicts Leischner. Engaging internal and external stakeholders early in the decision-making process has been critical for coping with gate constraints, he notes. "A collaborative approach with airlines and tenants is important in finding sustainable solutions," he explains. "Providing a world-class remote passenger hardstand operation is important to the airlines operating into and out of Seattle." Cancun International Airport (CUN) has eight Aviramp units at work on its ramp-seven Continental models and one International. The airport, operated by Grupo Aeroportuario del Sureste (ASUR), primarily uses the ramps to assist travelers with special needs, notes Airport Director Carlos Trueba Coll. "They provide excellent support facilitating the embarking and disembarking of passengers, especially those with disabilities," he explains. Already well known as a vacation destination, Cancun is also emerging as a popular market for medical tourism. According to surveys conducted by local hotel associations, about 12% of CUN passengers are older than 60. "Therefore, and naturally, it is expected to have an increase in the number of passengers with [additional] needs," Trueba Coll says. Terri Smart-Jewkes notes that the gradual slopes on Aviramp products allow passengers to board and disembark safely and more quickly than other devices. "Air stairs can often be a safety challenge for even the most able-bodied passengers," she remarks. "Improved safety and operational efficiency work hand-in-hand." 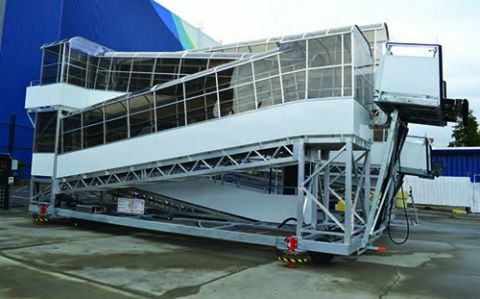 According to Trueba Coll, CUN specifically searched for mobile boarding ramps that would fulfill international standards for use by travelers with physical disabilities; but the airport also prioritized other factors, such as reliability, operability, maintenance ease and low acquisition cost.